Bryan Meadan enjoying one of his beers. Why is this beer different from all other beers? Four cups of wine at the Seder are a must. But what about beer? Until now, those who observe the Passover dietary laws have had to forgo the amber brew. Now an Israeli company, Meadan Craft Brewing, has developed a date ale that is certified kosher for the holiday. The brewery was founded in May 2015 in the northern city of Karmiel by Bryan Meadan, 53, and his wife, Danna, 48. 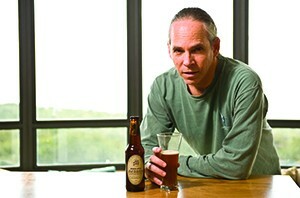 Bryan—a sociologist who moved to Israel from Los Angeles in 1983—was not thinking about Passover when he embarked on his brewing career. In 2006, he was diagnosed with celiac disease, an autoimmune disorder in which gluten consumption can damage the small intestine. According to the Celiac Disease Foundation, the disorder is estimated to affect one in 100 people worldwide. According to Bryan, another 5 percent of the population is sensitive to gluten. He couldn’t find a gluten-free beer he enjoyed, so he started brewing his own, experimenting first with buckwheat. Then he tried chickpea flour, producing what is popularly called hummus beer. And then he tried dates. According to Danna, all three gluten-free Meadan beers are technically kosher for Passover—for Sephardic Jews, whose Passover dietary rules differ from those of Ashkenazic Jews. Only the date beer is suitable for Ashkenazic Jews, too. “We had to choose, and we went for the certification that would include all Jews,” Danna said. Meadan’s Amber Date Ale, which is not sweet despite the ingredients, is the company’s best-selling line, both in Israel and the United States, followed by Special Date Ale, which is somewhat bitterer. The beers have kashrut certification from Israel’s Chief Rabbinate as well as from Hatam Sofer Bnei Brak. In the United States, Meadan’s beers are available in shops in California (a list appears on Meadan.com) and can be ordered online by consumers in California, Oregon, Washington and Arizona. “In the United States, to get permission to market, you have to deal with each state separately,” Meadan said by way of explaining the limited availability of his beers in America. To get around this, his next step is to start producing his gluten-free beers in the United States, while maintaining local production in Israel. Where can I buy or order Meadan Beer..aASAP!